Your day-by-day itinerary now includes Clingmans Dome as well as Ripley's Aquarium of the Smokies. 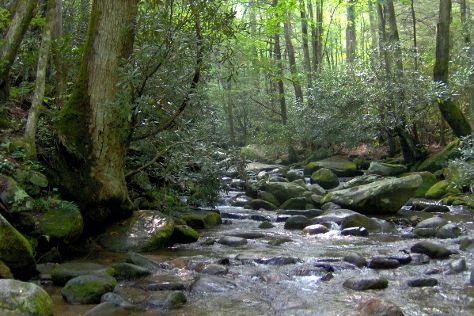 Get outdoors at Roaring Fork and Cades Cove. Next up on the itinerary: cool off at Dollywood, take in the awesome beauty at Mount LeConte, and take in the dramatic natural features at Chimney Tops Trail. To plan Gatlinburg vacation without wasting time, ask Inspirock to design an itinerary. Kalamazoo to Gatlinburg is an approximately 6.5-hour flight. You can also drive. Traveling from Kalamazoo in July, expect a bit warmer with lows of 69°F in Gatlinburg. You will leave for Raeford on the 2nd (Fri). Raeford is a city in Hoke County, North Carolina, United States. Get out of town with these interesting Raeford side-trips: Aloha Safari Zoo (in Cameron) and Fantasy Lake Water Park (in Hope Mills). To see where to stay, photos, maps, and more tourist information, read our Raeford trip itinerary planning app . You can drive from Gatlinburg to Raeford in 5.5 hours. Another option is to fly. Expect a daytime high around 89°F in August, and nighttime lows around 69°F. Wrap up your sightseeing on the 6th (Tue) to allow time to travel to Beckley. Beckley is a city in and the county seat of Raleigh County, West Virginia, United States. Start off your visit on the 9th (Fri): admire the majestic nature at Grandview State Park. For other places to visit, reviews, more things to do, and tourist information, go to the Beckley trip itinerary maker website . Traveling by car from Raeford to Beckley takes 5 hours. Alternatively, you can fly. Expect a bit cooler temperatures when traveling from Raeford in August; daily highs in Beckley reach 79°F and lows reach 61°F. You will leave for home on the 10th (Sat).